Hi guys, just wanted to check in with you as a wrote about Tough Mudder as one of my goals for 2017. Well now it’s done! It’s been a couple of weeks since we ran it and my muscles have recovered but I am still sporting bruises and scratches all over my limbs. Although the bruises have started changing from deep purples to yellow-brown so it’s about the right time to gather my thoughts about the experience. 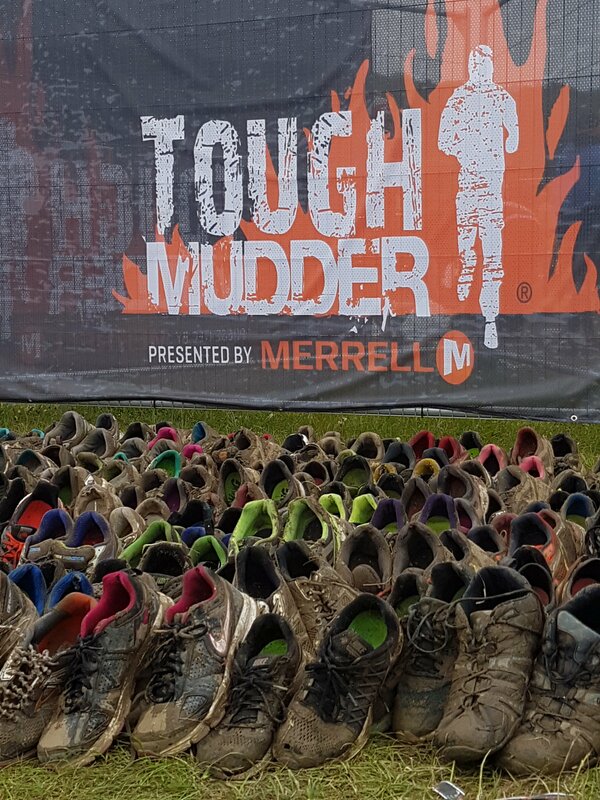 My experience is as a first time mudder-er with reasonable fitness and very little strength. Firstly, the “undulating hills” mentioned in the website blurb was, of course, an understatement. The West London course out in Henley-on-Thames was beautiful, and on any other day a casual observer may describe the landscape as undulating. But for a runner, caked in mud, dunked in ice and still on the first mile, they were more like Everest. All my muscles screamed at me whenever I attempted to run uphill. More than any obstacle, the uphill sections of the course were the biggest challenge for me. Tough Mudder was much more about team work than I realised. Happily for me, someone who can’t lift their own body weight, the majority of obstacles were about coming together as a team to climb a wall, wade through mud pits and scale slippery slopes. I am so grateful to the team for helping make the day so enjoyable. I can’t deny that I was the weakest link on the team but the rest of the guys were patient with me and Ben was a trooper and stuck with me while I battled up the hills to meet the others at the next obstacle. Secretly, I think he was grateful to take it easier with me. We both did train for the three months leading up to the event but with both of us having a lot going on with work and suffering quite bad colds in the lead up, the training wasn’t what it could have been. I had to take tissues with me around the course! But sickness aside, I do think I was in a much better place than I could have been and mentally I was unapologetic. I knew I had done my best in training and did my best on the day. I fronted up to every hurdle and moved the whole time so I had little stress about being the slowest in the team, something I know I would have stressed about if I hadn’t trained. For me too, going from zero, as in having very little upper body strength, to the kind of condition you would need to be in to complete some of the tasks was unrealistic in three months. But I will keep trying, one day I will be able to complete a press-up. The other thing that helped me a lot was having great kit, something that I was moaning about beforehand. The event is expensive enough as it is, I really didn’t want to sink any more money into kit for something that I may not even enjoy. But I must say, I had to take back all my moaning. One of the most important things running in mud and water are your shoes. I’m no expert but I think if you really want to give this a proper go, you need some form of trail running shoe. Simply, a shoe with big ‘lugs’. Lugs are the spiky bits on the bottom of football boots for example. They allow you to run in mud without slipping over and, if they are spread far enough apart, allow the mud fall out rather than cake to the bottom of your shoe. We passed many people on the way shaking grit from their shoes, suffering blisters and slipping around on the running tracks. Of course we were all slipping in the mud pits, but I was grateful to not be slipping around while my team mates ran off ahead. I got these Asics Gel-Fuji Runnegade for £60 and now far from resenting the cost, I am in awe of them. Firstly, how cool do they look?? Secondly, they did exactly what they needed to re: mud. They made me feel a hell of a lot more secure running downhill. They kept all grit and mud out and managed to keep me comfortable the whole time. Despite being wet in the first mile I never got a blister or even an inkling of one. All this in their first outing as I never managed to take them out of the box to train in them beforehand due to the cold. So I was impressed to say the least. I also wore ‘no blister’ socks that Ben loaned me which could have helped, but really, I like to think it was all the shoes. So there you have it, my review of Tough Mudder. Which really boils down to – get some trail running shoes and try your best to get as fit as possible to make it easier on the day, but whatever your ability it is a team race and in the end is all about having fun. Have I convinced you to give it a go? Photo credits to the Tough Mudder professionals and the team. The selfie was all me though.